Joining our Long Range Forecast this weekend are two films which have been the recipients of noticeable buzz early on in 2013. Will that fact carry over into strong box office runs for both? 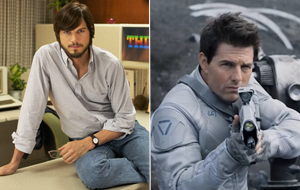 Oblivion, one week after its IMAX debut, will go into wide release on Friday, April 19 alongside the Steve Jobs biopic, jOBS. - While he has only been in a few science fiction films, Tom Cruise has had success in the genre with War of the Worlds and Minority Report. - Thanks in part to being a science fiction film, there is more of an event film feel here than Jack Reacher had back in December. - Opening a week early in limited IMAX release will help holding power, especially if the film is well received. - This is the highest profile release of April, at least on paper. - Without Steven Spielberg attached, will the combination of Cruise and science fiction have anywhere near the same level of appeal that it had in the past? - After a career resurgence with Mission: Impossible - Ghost Protocol, Cruise certainly didn't light the box office on fire last year with Rock of Ages and Jack Reacher. - While initial holding power is likely to be strong, launching wide two weeks before Iron Man 3 and four weeks before Star Trek Into Darkness will obviously hurt the film later in its run. - Will appeal to fans of Steve Jobs and Apple. - Ashton Kutcher has proven to be a consistent draw at the box office over the years. - Early reactions suggest that word of mouth is likely to be very mixed. - While Kutcher is still a draw, whether moviegoers are interested in seeing him portray Jobs remains to be seen. - Opening against the higher profile Oblivion will be no easy task. Notable changes on our forecast this week include Jack the Giant Slayer, 21 and Over, The Last Exorcism Part II, Phantom, Oz: The Great and Powerful, Dead Man Down, The Call, G.I. Joe: Retaliation, and The Host. Check out our predictions for these and other upcoming films in the table below. 42 (2013) Apr 12, 2013 Warner Bros. I am follower of this tutorial and getting all imp information to connect my desktop with remote.Use this and http://remotedesktopwindows10.com/ learn for free and online.Much Thanks to you for your time here.